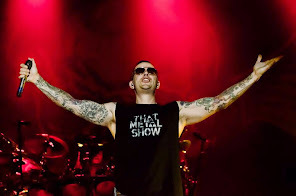 Avenged Sevenfold News: M.Shadows: "There are songs on Hail to the King that are just made for the live setting, and..."
M.Shadows: "There are songs on Hail to the King that are just made for the live setting, and..."
Will you be including songs from your newest album, Hail to the King, as well? Yeah! In the States, we toured right on top of the record, so it didn’t have time to really sink into the marketplace—it usually takes half a year, at least, before people actually know all the songs. There are songs on Hail to the King that are just made for the live setting, and I think they’re going to go over really well on Mayhem.